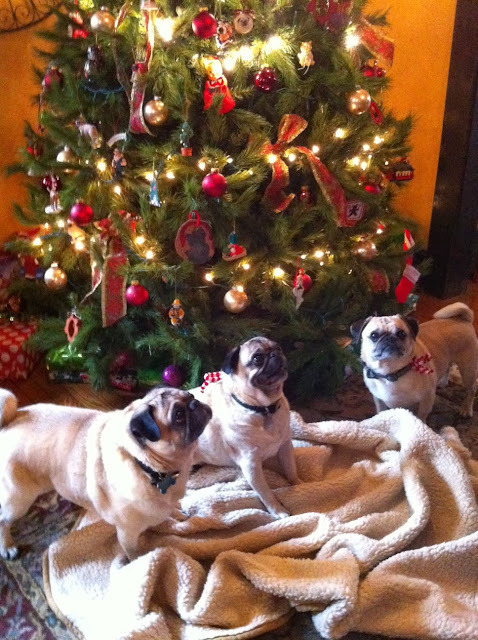 Observations on life from Pug Buddy Fergurson and his friends. 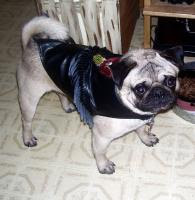 In early 2008 Buddy Fergurson's mom was looking through Petfinder.com when she came across a photo of a fine looking young man sporting a blue fringed vest, named Weenie. She immediately sensed that this was no ordinary dog and proceeded adopt him. Weenie, who eventually confided his real name was Buddy, had been living with his rescue mom Marylou from Rawhide Rescue in New Jersey. Marylou had liberated him from a bad childhood, nursed him back to health, given him tons of love, and was now ready to find him a new, permanent home. Buddy Fergurson is a happy and healthy guy. He loves his life, family and friends. He also likes to share his observations on the world with his mom (Diane) who began posting them on her FaceBook page. When people started asking her "Well, what would Buddy say about that?" she decided that he needed his own blog. Around Christmas 2008, Buddy's mom decided that he needed a few less naps and a little more action in his life. 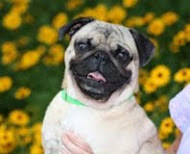 Scrolling once again through Petfinder.com, a young, bubbly, happy little guy named Jake looked like he would be the perfect answer! Jake had been found wondering around Patterson, New Jersey. He was put in a kill shelter and 7 days later was scheduled to be euthanized. Luckily Pug Planet Rescue was contacted in time, Jake was successfully rescued. He was now ready to be placed in a permanent home. Shortly after his adoption, Jake told Buddy's mom, after watching his favorite Terry Gilliam movie one evening, that he would really like to have the name Kevin instead. She figured, why not? What household doesn't need it's own little Time Bandit? A magical love connection occurred early one Saturday morning, when Buddy’s mom ran across Franky’s charming little face in her Facebook feed. Franky’s (aka Milo’s) story had been added to Pug Planet Rescue’s Facebook page to try and help Animal Allies find him a new forever home. Sadly his previous family could no longer care for him. It had been a year since Princess had left the household, and Buddy’s mom just didn’t think that things seemed quite normal without 3 little ones running around under her feet all day. She missed the commotion (go figure). Franky seemed like he would fit in well with Buddy and Kevin, and after a quick query to Animal Allies, Buddy and Kevin were whisked away on their first ever field trip to meet their new brother. Chuckling that Franky had the best smile and shortest legs that they had ever seen on a Pug, love at first sight on Facebook was confirmed, and everyone welcomed this aborable little guy with open arms and warm hearts into the family. In addition to his new home, everyone also agreed that Milo needed a new name. For awhile he became Cecil, then eventually Franky....with a y. Copyright Diane Fergruson on all text and photos. Watermark theme. Powered by Blogger.